Sicily's greatest natural attraction is also its highest mountain. To the ancient Greeks, Mount Etna was the realm of Vulcan, god of fire, and the home of the one-eyed monster known as the Cyclops. At approximately 3350 meters, it is Europe's highest active volcano. The height of its summit changes with each eruption, and over the centuries a few lava flows have reached the coast. 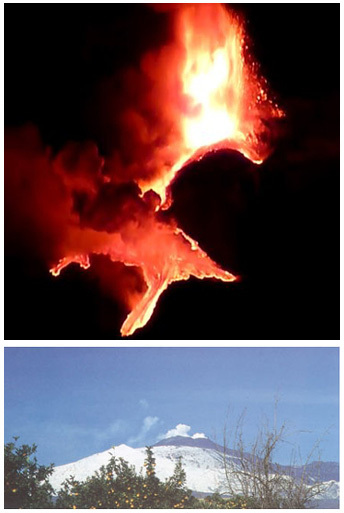 Over 1200 square meters of Etna's surface is covered with solidified lava. Etna offers skiing in the Winter months and breathtaking hikes in the woods during the Summer. There are also a number of smaller peaks on the slopes of Etna, and some interesting caverns. Since Etna is a strato volcano, with relatively cool lava temperatures and numerous openings (vents), nobody ever knows precisely where on its vast surface the next eruption will be. Etna's long recorded history has proven invaluable to the world's volcanologists. Various species of oak and stone pine, as well as birch and beech, cover much of its sloped surface. Broom plant and other shrubs dot the area, especially at lower altitudes. Etna's deciduous trees change color in the Autumn, creating a spectacular panoply of changing shades. Frogs, toads and turtles live in the streams and small ponds of Etna's forests. There are also various species of snakes and Sicily's ubiquitous lizards. Foxes, squirrels, weasels, hare, hedgehogs, porcupine and a few wild cats also consider Etna their domain. Overhead, you'll see owls, falcons, partridges and the occasional golden eagle, a Mediterranean species re-introduced here in recent years. In the Gurrida Lake area, there are herons, ducks and migratory birds. The scenic Alcantara Gorge is located on the Alcantara River north of Mount Etna near Taormina off Route 185. This beautiful rock formation, composed of basalt, was created by volcanic activity. For Visitors: Remember that it's always quite a bit cooler on Etna than it is in the valleys or along the coast. There are several roads into the park, and even a railway line from Catania to Riposto (though with only occasional departures), as well as bus service from Catania. Western Slope: Monte Gallo and Rifugio della Galvarina. Start at the clearing on the slope of Mount Gallo, reached via the Nicolosi-Adrano road, following the road for about 12 kilometers to the sign indicating Monte Intraleo. This hike leads to the Galvarina forest refuge. Monte Nero degli Zappini Nature Trail. This trail offers a view of some of the typical natural settings of the area. It starts from Piano Vetore, which is not far from the Grande Albergo dell'Etna. Mount Zoccolaro Nature Trail. Not far from Zafferana Etnea, this steep trek offers spectacular views of the Calanna Valley and the Valle del Bove with patches of aspen and beech woods along the way. Exercise caution because the path is flanked by a steep precipice.